In order for 4G mobile apps to really take off, service providers will have to start bundling the requisite bandwidth with the apps to promote wide-spread adoption. 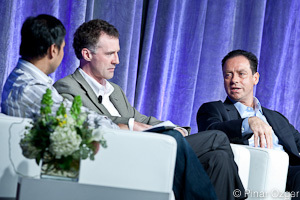 “You see developers putting enormous effort into ease of use for their [mobile] apps, assuming free bandwidth … but then those apps launch 100 connections,” said Wim Sweldens, president of Alcatel-Lucent’s (s ALU) Wireless division at Mobilize 2011 today. That load saps available bandwidth for the user pretty darn fast, especially since there are precious few unlimited data plans left for consumers. If consumers get whacked by huge cell bills, “they get confused, and confused customers aren’t good for anyone,” Sweldens said. And when it comes to smartphones, apps are where it’s at. Iyad Tarazi, VP of network development and engineering for Sprint (s S), agreed that bandwidth availability is critical. Sprint launched unlimited data plans four years ago in order to offer customers flexibility at a reasonable price, he said. That was not altruistic, however. “We wanted fast 4G adoption to drive the use of video, interactive gaming,” Tarazi said. Even as bandwidth costs reemerge as a concern for customers, the tools and middleware available to developers has made it much easier for them to build highly customized apps for a wide array of users, Tarazi said. And the infrastructure is getting smarter as well. “There will be middleware to help manage apps that are not disciplined,” and more sophisticated clouds will interoperate with the wireless network to optimize service delivery. The technology will figure out how to download a frame first, before all the content to make it a faster user experience, Tarazi said. Of these bandwidth consuming apps, the ones associated with mobile video are sure to be the biggest data obstacle that service providers will face. Mobile video consumption is on the rise and will soon account for over two thirds of all mobile traffic. With the consumerâ€™s cost-conscious ways of avoiding the higher data absorbing apps, will users stop viewing mobile videos, unless over Wi-Fi? We doubt it, but these â€œconfused consumersâ€ that Sweldens mentions know one thing for sure; streaming OTT video with stalling, blurring, blocking or jerkiness ruins the viewing experience. Measuring QoE is crucial for service providers to understand exactly what their â€˜confused consumersâ€™ are so frustrated with. Avvasiâ€™s technology is helping CSPs understand and leverage the opportunities created by the surge of internet-based, OTT video, offering highly detailed measurement capabilities that report video-based QoE. Avvasi OTT video analytics enable CSPs to understand the network impact of new devices and subscriber usage patterns, plan and dimension network expansion and optimization solutions, while reducing subscriber churn and maximizing revenue. For more information, please visit http://www.avvasi.com. The technology for pre-bundling apps with bandwidth (byte billing handled outside of the carrier network within the app itself) already exists and it is called “FreeBand”. Our company Box Top Solutions is already working on carrier trials in the UK. We are certain that app bundled bandwidth is inevitable globally, both as a customer value generation technology (dynamic pricing of bytes / carrier subsidized bytes / free delivery of bytes paid by app providers / etc.) and as a carrier byte and traffic optimization platform. wow, I love to see it if do some business in net .and i know google shentop net can find good news in business. We don’t need Unlimited Data as much as we need better batteries for smartphones first and foremost! i hear you there, christian!